The core message is that the secret to workplace success is simply making people happy. You do this by creating “opportunities for your people to win and feel like winners.” According to Mr. Tracy, this involves structuring jobs and teams around principles of clear goals, concrete measures, success experiences, recognizing achievement, and providing tangible and intangible rewards. The essence of his “make people happy” message is to be positive, upbeat, and noncritical. Praise often, specifically, and in public. 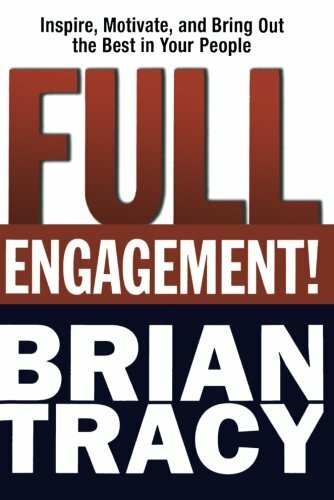 An active, high impact professional speaker—his bio states he addresses more than 250,000 people each year—Brian Tracy is distinguished by his ability to distill, interpret, synthesize, and package managerial material. His wide reading, complemented by his very effective integrating, organizing, summarizing style, comprises the essence of his distinctive competence: what he presents from the platform and the core of his books and informational products. Occupying the middle ground between the deeper, more thoughtful management treatises and the popular, sound byte, cotton-candy-content delivery of many motivational speakers/authors, Mr. Tracy presents solid, substantive material in an accessible way. Given the premises of Full Engagement!, the presentation would be stronger with more explicit inclusion of research on happiness and competitive performance. Had such research been consulted, the important impacts of place factors on happiness and performance would have been addressed in the book. Place has profound impact upon both happiness and performance. Place factors influence productivity, interpersonal interactions, moods and emotions, and ultimately, happiness. Place can be the difference between winning and losing. And, place branding effects influence perceptions, including one’s sense of self and, therefore, one’s “feeling like a winner”—or not. Mr. Tracy is not above advocating engaging in manipulation, if not overt misrepresentation, in order to make others—and yourself as well—happier. To this end, he relates the story of how a restaurant hostess discouraged him and his wife from sitting at a particular table that they favored, because it is serviced “by the worst waiter in the restaurant.” Insisting that the table with the worst waiter is where they wish to be seated, Mr. Tracy then tells the waiter that someone had mentioned to him that their waiter was the best waiter that person had ever had. Taken aback, the waiter wanted to know who had passed on what was evidently such unique praise. Mr. Tracy demurred, saying that he could not remember the obviously fictitious source. He then relates that he had a superb dining experience, resulting in all involved—the waiter, Mr. Tracy, and his wife—being happy. Brian Tracy asserts that how you treat people is more important than education, intelligence, or experience in determining a manager’s performance. As important as is treating people in a way that brings out the highest ROE—Return On Equity financial ratio. Happy employees do not necessarily translate into happy financial results, which are necessary for investors’ happiness. Notwithstanding his clear adaptation of ROE, no enterprise is sustainable if investor happiness is subordinated to worker happiness. While a happy workforce is by many criteria desirable, it is not alone sufficient to achieve great results. Rather, effective strategic decisions about the business model, creativity in developing products and solving problems, and the unrelenting application of the will to win are necessary success conditions. Indeed, the history of business has too many happy workers that are ultimately unhappy when their companies fail. Overall, Brian Tracy’s body of work is phenomenal; his profoundly positive impacts upon many are important; his self-made story is inspiring. That said, his prolific hyper-productive style can lead to some hyperbolic generalization that may be acceptable from the stage, but can appear to be jarring in print. Perhaps because he is moving at such a fast pace, Mr. Tracy can sometimes overstate his case, exaggerate his facts, and misinterpret his research. On page two he asserts that the purpose of strategy is to organize the business’s people and assets to maximize return on assets. Not so, for organization is a derivative purpose, to be addressed after the strategic direction and business model are first determined. Prioritizing organization over the high level, more important strategic issues runs the risk of The Bridge on the River Kwai effect, named after the movie, in which British prisoners of war did a masterful job building a superb bridge, no doubt in the process applying many of the practical, be happy principles that Mr. Tracy espouses. In their happy zeal to build a great bridge, the British POW leaders failed to recognize that the consequences of their happy organizational purpose were directly contradictory to their country’s larger war objectives, for the bridge would facilitate the transport of critical supplies and munitions that could immeasurably aid their country’s enemy. On page three, Mr. Tracy asserts that 65–85% of the costs of operating a business are salaries and wages. Not so, for corporate real estate, technology, and communications can account for meaningfully more than the 15% remaining after 85% is allocated to personnel costs, without even considering such expenses as professional fees, advertising, taxes, travel and entertainment, etc. Then, on the very next page, Mr. Tracy proclaims that everyone starts a job with no managerial skills. Not so, for many joining the work force were previously exposed to and learned managerial skills through prior activities including student government, team sports, class projects, and military service. Once past these shortcomings, however, Mr. Tracy delivers a worthwhile, relevant, engaging presentation.